Nothing really matters. All the things that we do not do, have or become in our lives can be important in shaping self-identity. From jobs turned down to great loves lost, secrets kept and truths untold, people missed and souls unborn, we understand ourselves through other, unlived lives that are imaginatively possible. This book explores the realm of negative social phenomena – no-things, no-bodies, non-events and no-where places – that lies behind the mirror of experience. Taking a symbolic interactionist perspective, the author argues that these objects are socially produced, emerging from and negotiated through our relationships with others. Nothing is interactively accomplished in two ways, through social acts of commission and omission. Existentialism and phenomenology encourage us to understand more deeply the subjective experience of nothing; this can be pursued through conscious meaning-making and reflexive self-awareness. 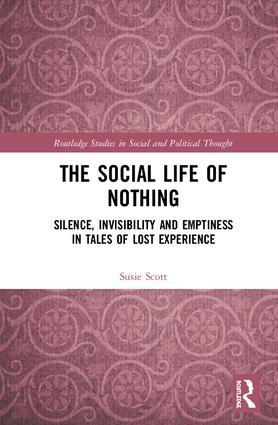 The Social Life of Nothing is a thought-provoking book that will appeal to scholars across the social sciences, arts and humanities, but its message also resonates with the interested general reader. Susie Scott is Professor of Sociology at the University of Sussex. With research interests in symbolic interactionism and dramaturgical theory, she explores questions of narrative identity and self-conscious experience: from shyness to swimming, performance art and total institutions. Susie is the author of Shyness and Society (2007), Making Sense of Everyday Life (2009), Total Institutions and Reinvented Identities (2011) and Negotiating Identity (2015).